It is always prudent to consider ways to increase your property value. Country houses with significant amounts of land obviously have more options and a popular one is to build a tennis court in the garden. Amongst property experts, the general consensus is that adding a tennis court to a country house could increase the value by at least £75,000 and possibly more than £100,000. With construction costs being significantly lower - from as little as £25,000 and rarely more than £50,000, adding a tennis court would appear to be a sensible investment. After all, what other options for investing in your property offer the potential of a three-fold return? Based on the financials, you would be forgiven for thinking that tennis court builders would be inundated with requests for new tennis courts from home owners. However, there are a number of things to consider before you can go ahead with a new tennis court, you cannot just build a court anywhere you like even though it is on your own land. 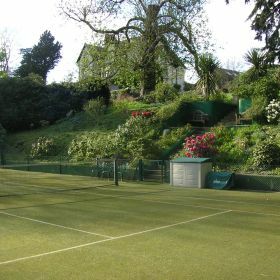 Tennis courts on paddock land require a formal change of land use, and even building a court within the garden may require a lengthy planning process. If the property is listed, the local Council’s Planning Officer will need to be convinced that a court within the garden will not have an adverse impact on the setting of the building. If you wish to put the court outside your garden in what is deemed agricultural land, then a Planning Officer may argue that a tennis court would impact on the wider open countryside. You will therefore need to think carefully about the design and location of your proposed tennis court. Using a green surface and using reduced height side fences can help to reduce the impact. Similarly, an inconspicuous location, hidden by existing or proposed hedge screening, will help to make the court more acceptable in planning terms. Equally important is the need to back up your planning application with the appropriate national and local planning policy justification. It is surprising how important it is to draw Planning Officer’s attention to the relevant planning polices to support the introduction of your tennis court. A tennis court can bring significant added value. Ensure you take the time and effort to think carefully about the design and location of the court as well as ensuring that the planning issues are fully addressed. If you are not yet a regular player, this could be the perfect opportunity to get some lessons organised…!